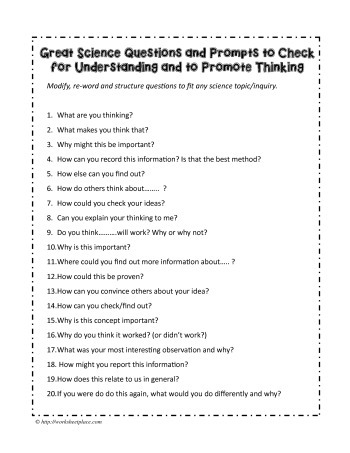 Modify, re-word and structure questions to fit any science topic/inquiry. How can you record this information? Is that the best method? How else can you find out? How do others think about??.. ? How could you check your ideas? Can you explain your thinking to me? Do you think?? ?.will work? Why or why not? Where could you find out more information about?.. ? How could this be proven? How can you convince others about your idea? How can you check/find out? What was your most interesting observation and why? How might you report this information? How does this relate to us in general? If you were do do this again, what would you do differently and why?